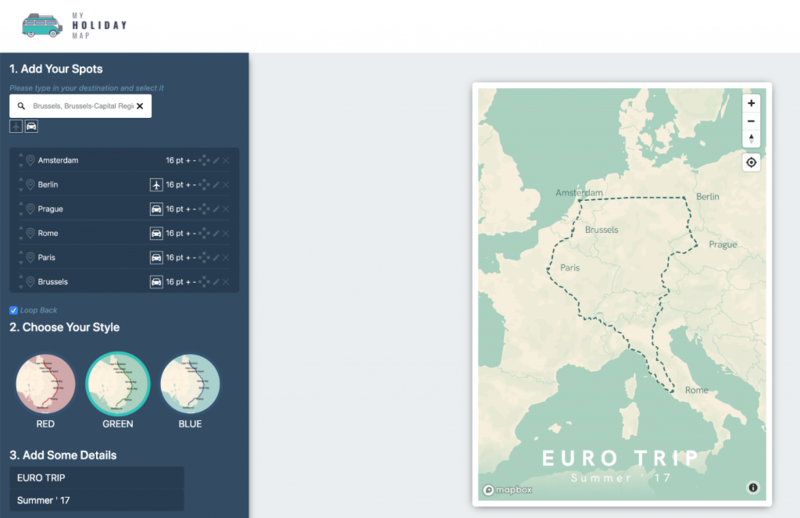 We have created one way to create a travel map, and we’re pretty proud of it. But, there are multiple ways to design your travel map. We would love for you to give ours a try, but some of the other ways to create a map are pretty cool as well! In this article, we will describe five different ways you can create your map. Some of them are pure digital, while others require a bit of manual work. We’ll leave it up to you to see what’s best for you. 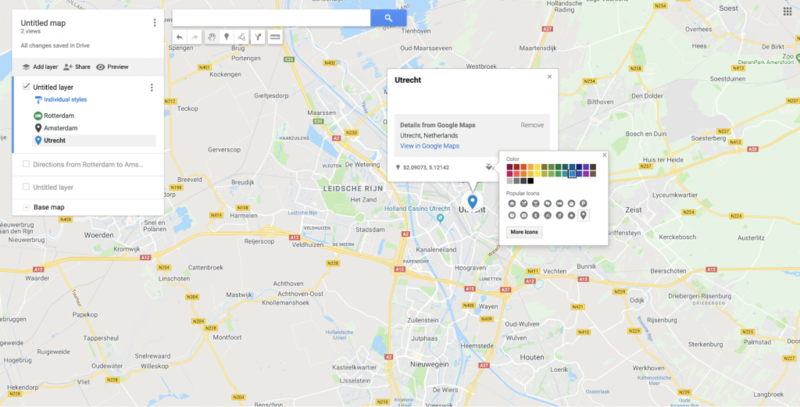 While it’s mainly used for directions, Google Maps can be used to create your own maps. You can make a map from your mobile, or you can do it from the browser, and you can end up with something like this. 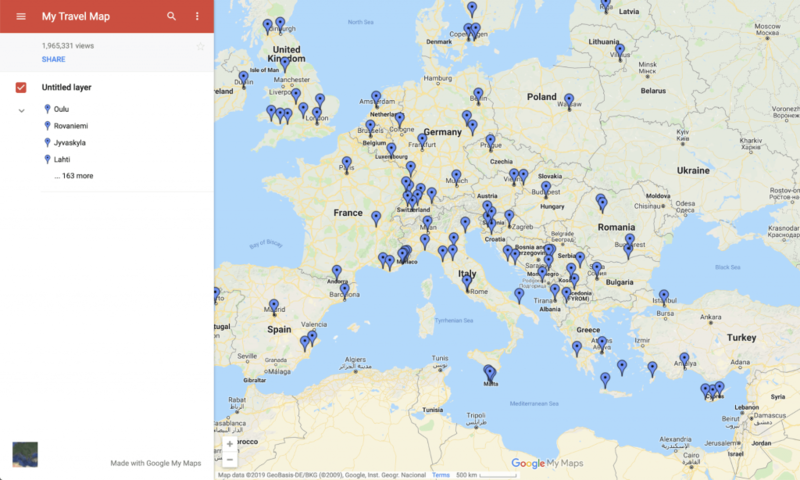 If you want to create a map, click on this link and start adding locations. You can change the pin icon and the colour of the map as well (see underneath). You can add destinations and add them to the map themselves, or you can create a route between the different locations. After you finish your map, you can publish it, whereafter you can share the link to your map with friends and families. 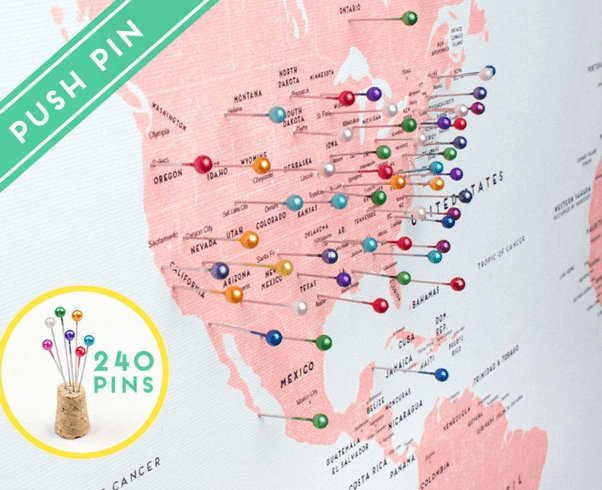 Another great way to make your own maps is by creating your own travel pin map. 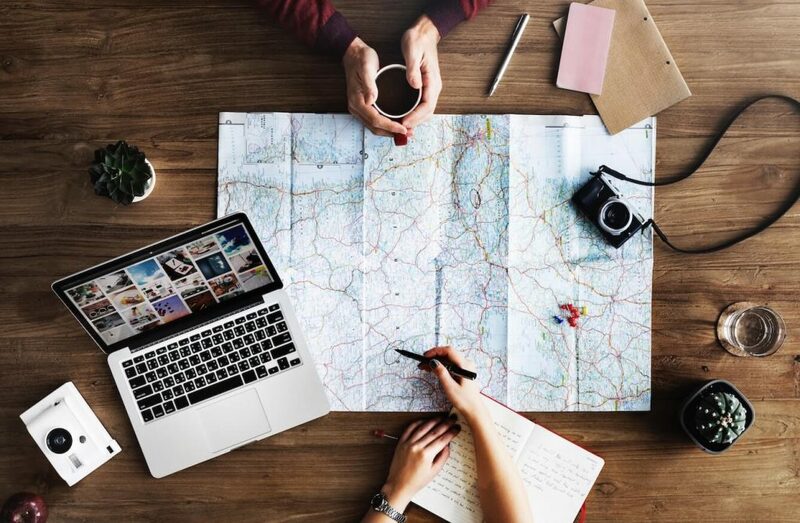 Travel pin maps, also called push pin maps, are geographical maps (in most cases of the world) that come with a set of push pins that you can press in the map to mark the locations where you’ve been or where you want to go. Sometimes rope is used between the push pins to create a route between the destinations. Make sure your travel pin map has a cardboard frame, so that you don’t start pressing push pins into your walls 🙈. You can find a lot of them on sites like Etsy. Another way to create a map of your travels is by using a scratch map. A scratch map lets you scratch of certain parts of the world map, whereafter it will become visible. The nice thing about a scratch map is that you can “collect” your countries. It’s quite satisfying to scratch open a new country after you’ve visited it. The hard thing about scratch maps is that it’s a collection of all your travels. You scratch off a new section every time you’ve been there, but it isn’t possible to see the different journeys that you’ve done since everything is on one map. In most cases, it’s not possible to show directions on the map. One other nice way to map a create map is to use an old-school highlighter. These highlighters are used in office environments to highlight important words or sentences within a document, but they are great for mapping directions as well. You can buy yourself a map at the local tourist shop and use the highlighter to highlight the places that you’ve been and the route that you’ve travelled. Aesthetical. We have designed our maps to be framed and hanged on the wall. Before we started My Holiday Map, but we couldn’t find a solution that would let us create a personal travel map that looks nice when printed. Your journey, your map. The journey is at least as important as the destination. With our tool, you can add your places, and we’ll automatically create the route between them. You can select your travel mode (car or plain), to make that the map matches your actual adventure. Delivered on your doorstep. Some maps that you can find on the internet looks absolutely fantastic but will take a lot of effort to create. They require extensive experience about sophisticated design tools and geographic information systems, or they will take quite a bit of manual labour. With our editor, everybody can create a great looking map of their travel, without breaking a sweat. Add your destinations, add some details, select your style and you’re good to go. We will deliver the map on your doorstep (free shipping), or we can send you a high-resolution PDF that you send to your local printshop. Ready to start creating your own travel map? Click here to get started! Have some more questions? Visit our FAQ.